The Magilla Gorlla Show was an animated series developed by Hanna-Barbera Productions for Screen Gems that was broken up into several smaller segments. The main segment starred the titular Magilla (Allan Melvin), an anthropomorphic gorilla who resided in Melvin Peebles’ (Howard Morris & Don Messick) pet store. 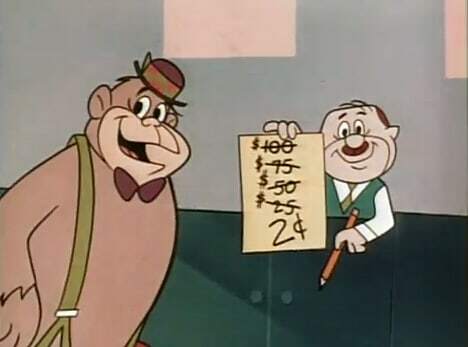 Peebles sought any way to get Magilla sold and out of his store before he ate away all his finances, but every attempt was only met with brief success as Magilla would constantly end up back at the shop. The only one genuinely interested in acquiring Magilla was a little girl named Ogee (Jean Vander Pyl) who could neither afford nor convince her parents to let her keep him. Punkin Puss & Mushmouse (top), Ricochet Rabbit & Droop-A-Long, and Breezley & Sneezley. 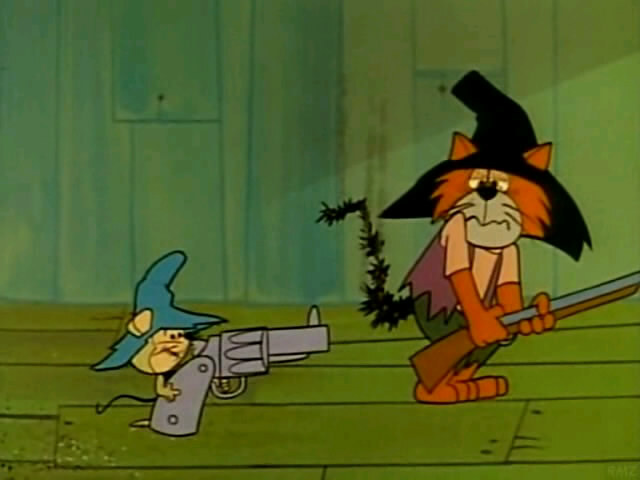 The next segment, Punkin’ Puss & Mushmouse, starred the hillbilly titular characters (voiced by Melvin and Morris, respectively) that took the classic cat and mouse formula and mixed it with a send up of the legendary feud of the Hatfields and McCoys. 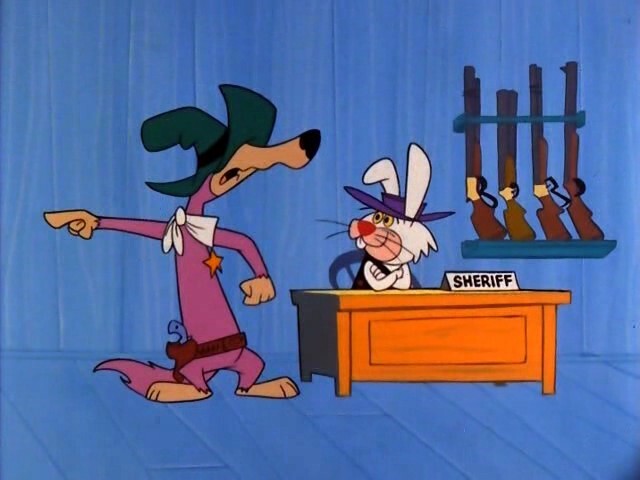 Ricochet Rabbit & Droop-A-Long followed the adventures of super-speedy rabbit sheriff Ricochet (Messick) and his slow as molasses deputy Droop-a-Long Coyote (Mel Blanc) as they protected the town of Hoop N’ Holler. Ricochet often employed a wide variety of trick bullets to thwart his foes. To promote their other series, The Peter Potamus Show, Ricochet Rabbit was exchanged in 1965 with that show’s segment Breezley & Sneezley. 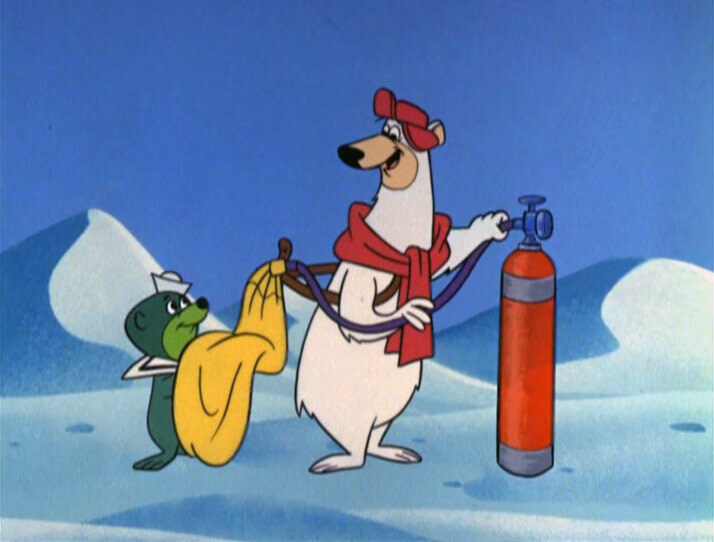 Breezly Bruin (Morris) was a resourceful polar bear who wanted to break into the local army camp for various reasons while evading its leader, Colonel Fuzzby (John Stephenson). Breezly’s best friend and sidekick was Sneezly Seal (Blanc), who had a perpetual cold that caused him to sneeze with a devastating power. Peebles giving away Magilla for a song. The Magilla Gorilla Show debuted in syndication on January 14, 1964. It was prefaced by a half-hour special, Here Comes a Star, hosted by George Fenneman who led the audience on a tour of Hanna-Barbera’s headquarters. In 1966, reruns of the show moved to ABC’s Saturday morning schedule. Hoyt Curtin composed the series’ music, including the theme whose line “he’s really ideal” was a nod to the show’s original sponsor, Ideal Toys. Magilla promoted Ideal in the original opening sequence by flashing their logo on a balloon and then on the television that showed the program’s title. A second version of the intro had Magilla’s face on the balloon and put introductions of the other characters featured into the show on the television.